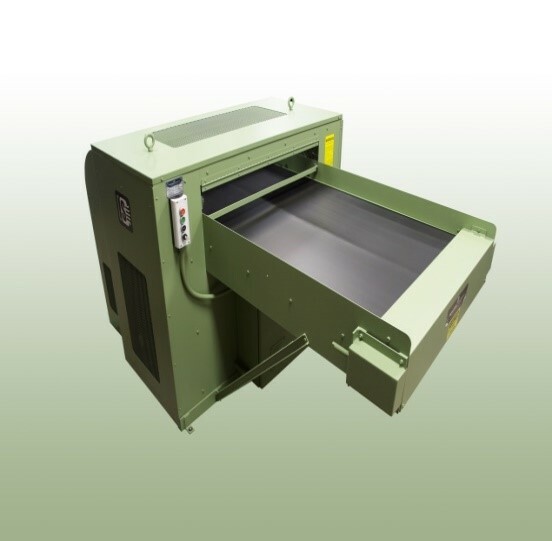 The 40-C is a High Performance Industrial Crosscut Shredder with a unique in-line proprietary two stage cutting system. Designed for high throughput and continuous duty operations the 40-C is suitable for centralized or archive shredding. High Speed at 110 Feet per Minute with a High Volume Throughput up to 3500 Lbs/Hr. The standard shred particle size is 1/4" x 1/4" with +/- 10% variance up to a max of 1/4" x 1 1/2" and is customizable with a cutting screen to eliminate variance. It can be customized to produce particle sizes to meet Various Security Levels from Level 2 / P-3 to Level 5 / P-6. The 40-C DOES NOT REQUIRE OIL. Oil Free is Green and environmentally cleaner and can result in long term Cost Savings as well. The Waste Capacity is unlimited with a standard drop chute into any size container. An Optional Air-Vac System is available to convey waste to a dumpster or a baler. Easily handles Paper, Card Board, Folders, Paper Clips and Staples, DVD/CD, Floppy Disks, Credit Cards and USB memory sticks. MADE IN THE USA.